On Wednesday, we attended the opening lecture of the D&D Building‘s Fall Market. Called “The Evolution of Design,” the session focused on the impact of social media and included some top names in our industry including: Michael Bruno (1st Dibs); Jonathan Adler, (Jonathan Adler); James Andrew (What is James Wearing); Heather Clawson (Habitually Chic); Brad Ford (Design Therapy) and Julia Noran (The Editor at Large). Sophie Donelson (also from The Editor at Large) did an amazing job as moderator – posing some questions that were on everyone’s mind. – Jonathan Adler’s “biggest store” is his website? He converted it into an e-commerce site four years ago and has never looked back. – You can have access to James Andrew‘s outrageous style. Well the paper doll version, at least! Scott McBee created a 1st Anniversary Paper Doll collection of some of James’ most memorable outfits. – Michael Bruno posts over 300 pages of editorial on 1st Dibs each month! We like to call that an online magazine! 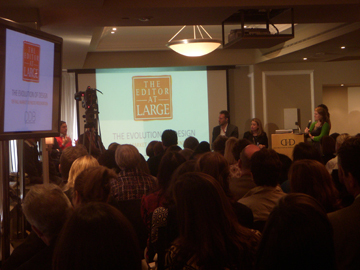 The event drew a packed house!